New Genuine Porsche Charge-o-Mat Pro Charger 12V Lead Acid & Life P04 Batteries. Independent Specialist in Porsche Parts & Repairs. Genuine Porsche Charge-o-Mat Pro Charger For 12V Lead Acid & Life P04 Batteries Brand new & unused This will fit Porsche Hybrid Batteries & The Porsche Motorsport batteries. Charger and trickle charger (5.0 A). The increased charging power reduces the battery's charging time. An additional charge mode for Porsche lightweight batteries (lithium-ion) facilitates their use in motor sports. This is suitable for all models of Porsche. It connects to the cigarette lighter or 12v charger socket. Or a addition add on can be bought and you can connect it to the cars battery Battery charger with charge maintenance and monitoring function. Will charge a flat battery and also keep you battery topped up and conditioned. As can be seen from the picture the kit comes with the plug in charger, long length of wire and the adaptor to plug into the cigarette lighter. This is for UK / 240v. Will fit all Porsche's with a cigarette lighter. Comes with storage pouch with Porsche lettering on it 958 044 900 72 Our Ref: Box 433. If you require any further information or other Porsche parts please message us. We cannot deliver to a 3rd party residential address. 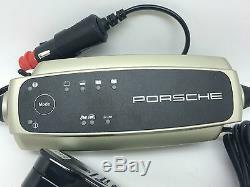 Genuine Porsche Charge-o-Mat Battery Charger Conditioner 996 997 986 Boxster UK. Porsche 996 997 986 & 987 Boxster & Cayman Handbrake Warning Light Switch. Pair Of New Genuine Porsche 986 Boxster Smoked Clear Headlights Right Hand Drive. NEW Genuine Porsche 991 981 Boxster Cayman GT3 Wiper Indicator Switches 3 Stalks. Porsche 997 Turbo PASM Damp Tronic Control Unit ECU -Genuine Porsche 99761812504. Genuine Porsche 958 Cayenne 2015 Onwards Roof Switch Panel, Overhead Console. NEW Porsche Boxster Boxter 986 01-04 Hood Roof Control Relay 986619900 Genuine. 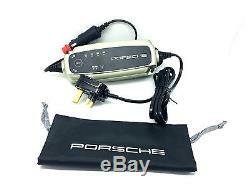 GENUINE PORSCHE 997 CARRERA GEN II FRONT END WIRING HARNESS FOR CARS WITH XENON. Heater & Air Conditioning Blower Motor Fan To Fit Porsche 964 & 993 - Left Hand. Heater & Air Conditioning Blower Motor Fan To Fit Porsche 964 & 993 - Right Hand. New Genuine Porsche 997 Turbo Gen 1 & 2 Coupe Rear Wiper Motor 997 628 080 00. Please note all our couriers deliver Monday to Friday only. We recommend that you use a tracked service to return any items as the package is your responsibility until it reaches us. A We will endeavour to do this for you however if the order has already entered our dispatch process it may be too late to cancel. 9 Apart Ltd formerly known as PorschApart was established in 1993. The business has grown from one mans hobby to currently employing ten staff. The 9 Apart team have over 45 years Porsche experience under their belts and are a very helpful bunch with a passion for all things Porsche related. We supply both new and used Genuine Porsche and aftermarket parts. 9 Apart is based in the town of Ramsbottom north of Manchester. We have over 18000 square foot of shelved parts in our warehouse, the largest indoor stock of new and used Porsche parts in the UK. We aim to dispatch all items that are in stock the same day. You dont need to be local to benefit from our high quality service, 9 Apart delivers its products throughout the UK, Europe and the rest of the world. So whether you need our products in Belgium, Brussels or Brazil we can sort it for you. If its new or used parts your looking for you can put your trust in 9 Apart. Porsche 997 Carerra S 19" Alloy Wheels 8" & 11 ET67 - To Fit 997 C2 & C2S. Genuine Porsche Cayenne 955 957 Black Centre Console Rear Grille Air Vent. Genuine Porsche 968 Owners Drivers Manual WKD 968 020 94. New Genuine Porsche 986 Boxster S Titanium Metallic Rear Boot Badge. Porsche Cayenne 955 Rear Bumper & Lower Valance - Black With Park Assist. Genuine Porsche Panamera Plastic Fuel Flap in Black 970 504 794 00 G2X. Genuine Porsche 955 957 Cayenne Off Side O/S Complete Side Sill. Yokohama Advan Sport 295 35 21 107Y N1 Porsche Cayenne Rated Tyre 4612. Yokohama Advan Sport 295 35 21 107Y N0 Porsche Cayenne Rated Tyre 3607. New Genuine Porsche Drivers Selection Black & Red Textiles Baseball Cap Hat. New Genuine Porsche 996 Carrera 986 Boxster Climate Control Unit Lower Surround. 2004 Porsche Cayenne Turbo V8 Breaking For Wheel Bolt x1 20 Wheels. New Genuine Porsche Racing Collection Backpack Back Pack WAP 035 450 0H. GENUINE PORSCHE LARGE CUP MUG TEA COFFEE GIFT 911 944 986 997 BOXSTER MAN SIZE! New Genuine Porsche 986 Boxster 996 Carrera Pre-Facelift Cup Holder Retrofit Kit. Porsche Drivers Selection Racing Lanyard Key Ring Strap - Genuine Porsche. Set New Genuine Porsche Colour Silver Crested Valve Dust Caps TPMS 99104460269. Set Of New Genuine Porsche Black Crested Valve Dust Caps TPMS 991 044 602 67. New Genuine Porsche 987 Cayman Rear Boot Luggage Cargo Net 2006 - 2012. New Genuine Porsche 986 987 Boxster 996 997 Turbo GT3 GT2 Fuel Cap Petrol Cap. Pair Of Genuine Porsche 996 Carrera Black Right Hand Drive RHD Floor Carpet Mats. New Genuine Porsche 997 Carrera Black Right Hand Drive RHD Carpet Floor Mats. SET OF FOUR GENUINE PORSCHE 928 964 968 993 EXTENSION WHEEL ARCH RETAINERS. NEW Genuine Porsche 986 Boxster Pair U Bend Silencer Exhaust Pipe Clamps x2. 2002 Porsche 996 Carrera 4 Tiptronic Facelift for Breaking - x1 Wheel Bolt. New Genuine Porsche Script Logo Rear Badge In Chrome. New & Used Porsche Parts Supplier, Servicing & Repairs. Reliable and fast help for your online shopping. All ready for immediate dispatch. The 9 Apart team have over 45 years of Porsche experience under their belts. We aim to use the best possible couriers at the most competitive rates. Over 99% (30,000+) 5 star feedback. 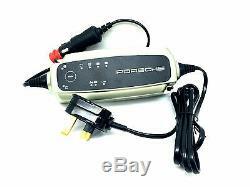 The item "New Genuine Porsche Charge-o-Mat Pro Charger 12V Lead Acid & Life P04 Batteries" is in sale since Thursday, June 29, 2017. This item is in the category "Vehicle Parts & Accessories\Garage Equipment & Tools\Other Garage Equipment & Tools". The seller is "9-apart-ltd" and is located in Bury, Lancashire, UK.